Exact figures for the number of discarded pens in the UK are not readily available. However, in America, 4,000, 000,000 pens are thrown away every day which gives an idea as to the amount of waste that can be generated by such small items. There are a number of things you can do to avoid putting broken pens and pencils in the bin. Obviously, one of the best things that you can do is avoid buying disposable pens and instead opt for pens that are refillable. Also, you can buy disposable pens which are made from recycled materials. But what about the useless pens and pencils that you already have? Firstly, check whether your pen really is finished. Try wetting the nib slightly or adding a couple of drops of water to the tube. Running the nib through a lighter flame can also sometimes get the ink moving. Emptying out the tube and using it to store something such as beads? Close the end with tape or similar and use the tube for glitter. You could also use the tubes as seed markers in the garden. Put them on Freecycle. This might sound pointless but you really do never know what other people want. For example, the Pen Guy is a graphic designer in America who has recycled pens to create a ‘Mercedes Pens’ car, covered in pens (which he drives every day). He is always looking for donations and is interested in what else he can do with pens and how he can keep them out of landfill. Why not look up “The Pen Guy” and donate your pens? Use the (cleaned!) tubes as drinking straws or drinks stirrers. 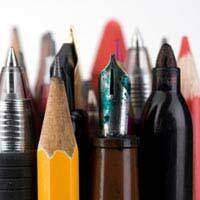 Buy high-quality pencils and erasers as they are less likely to result in the lead breaking. You can keep sharpening them even if the lead is broken and use the shavings as kindling. You can also use pencil sharpenings as pot pourri with a few drops of perfume or scented oil. Be creative. People have been known to use pencil shavings in collages, decoupage, jewellery-making and more. Use pencil shavings in pet bedding. You can also re-use wax crayons, even if you think they’re too small or have broken into small pieces. Just sort the pieces into colours. This doesn’t have to be exact – just similar colours. You can also of course experiment by making new colours with different crayons. You’ll need moulds – you can use anything you like (as long as its suitable for the oven or the microwave, depending on how you melt the wax). You could use ice cube trays, muffin cases, little dishes and more. Break the crayon pieces up as small as you can and place them in the moulds. You’re then ready to melt the crayons down. In the microwave you should be able to melt the wax at a low heat in five minutes. In the oven, set the heat to around 250 degrees and wait roughly 20 minutes for the wax to melt. Don’t forget to check your mould is suitable for your heating method. Once the wax has melted, allow it to cool and pop out your new crayons.